This map was published in Philadelphia in Henry Carey and Isaac Lea’s “Complete Historical, Chronological and Geographical American Atlas” in 1822. Many of the original map drawings were drawn by Fielding Lucas, one of the earliest successful map-publishers in Baltimore. This antique piece of Americana displays the state of Mississippi as it was in 1822. The map is divided into many different fragments, showing the Choctaws and Chickasaw possessions to the north. Just two years before the publishing of the map, the land marked Hinds was ceded to the United States, and was yet to be annexed (marked in green). Another item worthy of note is “General Jackson’s Road from New Orleans to the Muscle Shoals”, it was used by General Jackson during the war of 1812 to reach New Orleans quickly and win the legendary Battle of New Orleans, the victory that catapulted him into the Presidency. 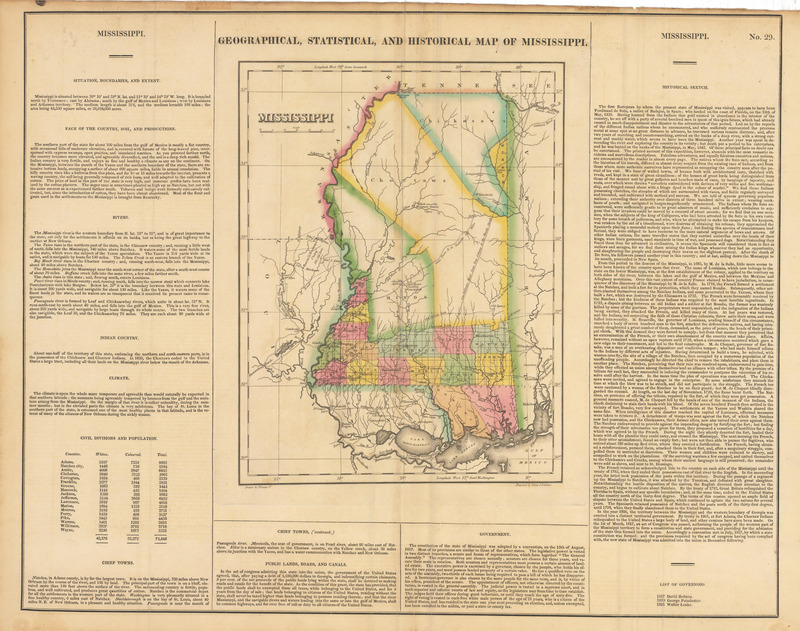 Surrounding the map are many different details about the state of Mississippi as it was in 1821. Topographical, historical, and statistical data line the sides, with thorough census data. A state in transition, this historic map captures the evolution of the Magnolia State to the fullest. Condition: This map is in an A condition. There is minor chipping on the left side of the margins, and a slight centerfold separation which does not affect the image nor the text. This map has full margins and is attractively colored.